This is not an NRA Affiliated Program, however, this program is endorsed by On Target NW, Inc.! 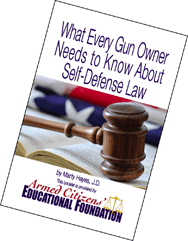 Every student will recieve a personal hard copy of this booklet and approximately two-hours of additional classroom instruction covering the information in the booklet, and the Oregon Laws (pertaining to concealed firearms carry and self-defense), as part of every pistol and concealed carry course we teach. This course is also available as a stand-alone course if you already have your concealed carry license or permit. The information in this module alone, is worth the cost of the entire training course and may make the difference between sleeping in your own bed after a self-defense encounter or spending some time locked up in jail or prison. Call for details.